[Stride]-Stride Step-[Choose one or more cards with the sum of their grades being 3 or greater from your hand, and discard them] Stride this card on your (VC) from face down. 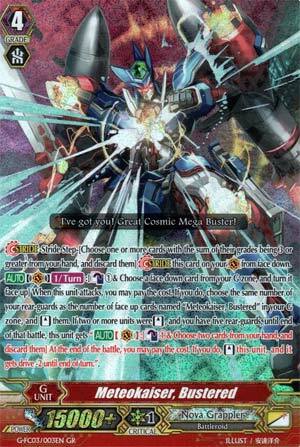 [AUTO](VC)[1/Turn]:[Counter Blast (1) & Choose a face down card from your G zone, and turn it face up] When this unit attacks, you may pay the cost. If you do, choose the same number of your rear-guards as the number of face up cards named "Meteokaiser, Bustered" in your G zone, and [Stand] them. If two or more units were [Stand], and you have five rear-guards, until end of that battle, this unit gets "[AUTO](VC):[Counter Blast (1) & Choose two cards from your hand, and discard them] At the end of the battle, you may pay the cost. If you do, [Stand] this unit, and it gets drive-2 until end of turn.". Yay for the option to save Victoplasmas. Bustered here, once per turn on attack, Counterblasts 1 and flips a G Zone card face-up, then for every Bustered face-up in the G Zone, stand that many rear-guards you control. If you stand at least 2 and you control 5 rear-guards, after the battle's finished, you may discard two cards and lose 2 Drive Checks to stand Bustard once that turn. Basically here to make for an easier Victoplasma and/or spring an emergency Victor. Anything that can re-stand after an attack is a good card in my book, but it's not perfect given it still can't recover from a good board wipe. Other than that, as long as you're not playing against anything that can interfere with your formation, this is as solid a card as any, and works nicely in conjunction with Victoplasma. It also gives you the second finisher G Novas badly craved, so get 4 for that if nothing else. So, we have a unit that, on attack, CB1, flips a unit in your G deck face up and then, for each copy that's face up, stands up a rear-guard. If two or more stand up and you have a full rear-guard, this restands and gets a single drive check. Well, Nova Grappler loves to restand everything. I'm pretty sure Kamui would love this card. I'd say it's worth a shot, especially since you can combine with Cool Hank for lots of nice tricks.